I met Laura with her mother Carol for the first time in February. I love all my clients but I love those that I not only develop a friendship with, but those that challenge me. Laura and Carol did just that. She wanted a modern wedding filled with unique flowers and details. The reception, in the Waterford Room, at the Galt House (downtown Louisville) was quite breathtaking. White modern chairs, brushed metal chargers and table tops, sleek black accents and decorative chandeliers. At night overlooking the city, this room stood out with elegant charm. For Laura's wedding we detailed everything. 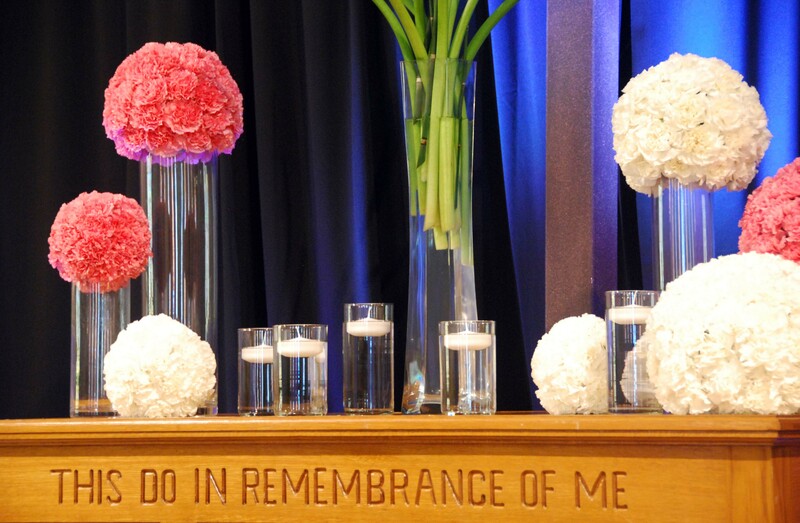 I drew sketches of bouquets and altar arrangements, personally designed all the decor and added a modern flare wherever possible. 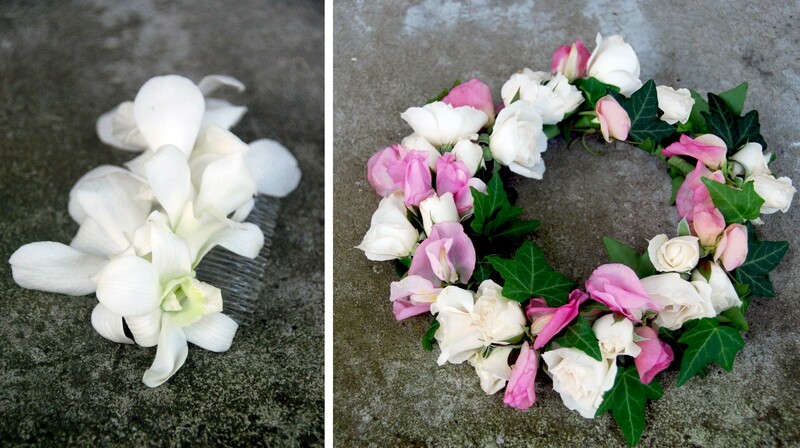 On top of that Laura, her mother and the rest of the family had sentimental connections to a variety of flowers, poppies, sweet peas and roses which we linked nicely into all the wedding decor. Laura's bouquet was outstanding. A fluffy white peony bouquet given a modern attitude with pops of yellow pin cushions and a cluster of sleek white calla lilies clustered in the center. The callas sat slightly higher than the other flowers. 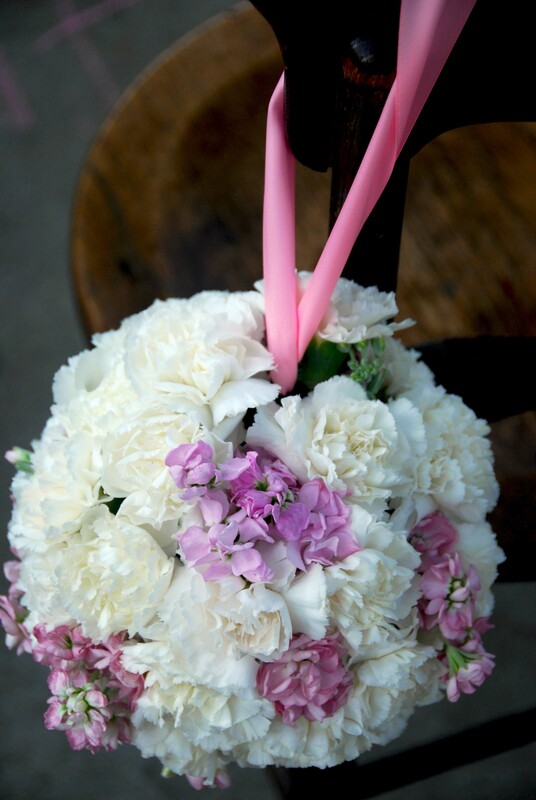 Laura is tall and slender so we wanted her bouquet to compliment her body. It did just that. 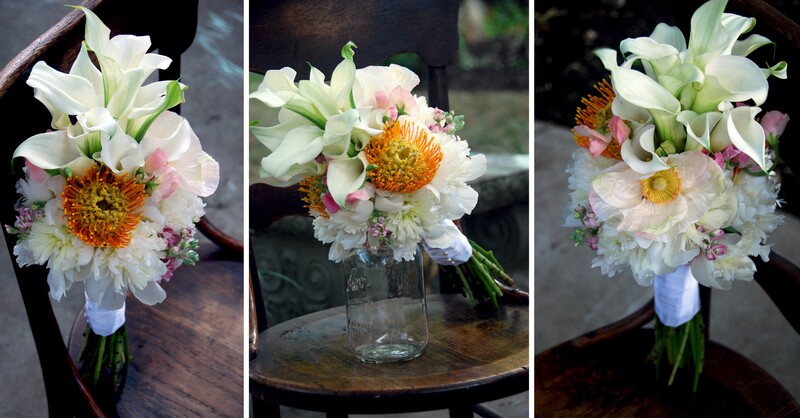 The Bridesmaids' bouquets followed the same rhythm. 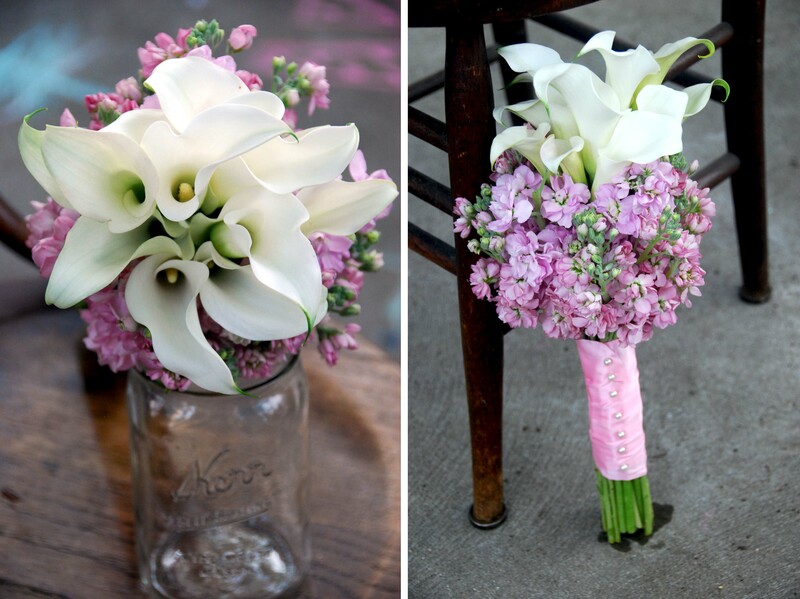 We took a light pink stock bouquet and placed a cluster of white calla lilies in the center. 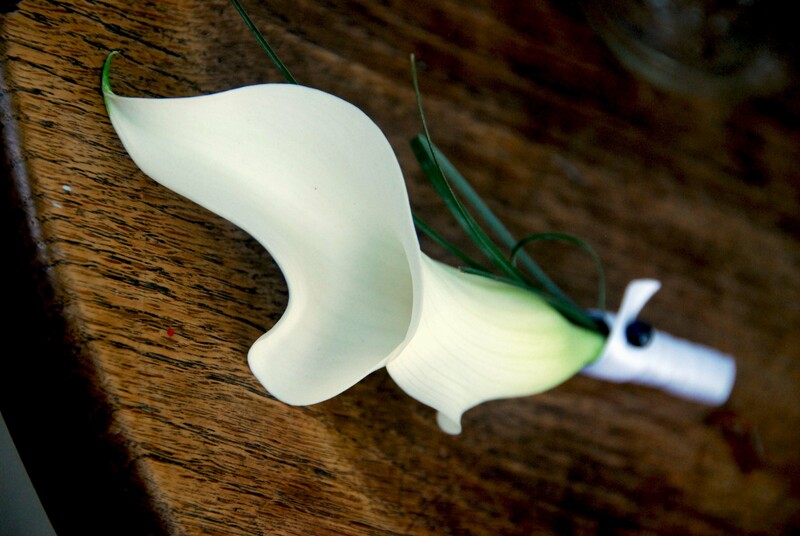 Again the calla lilies were placed slightly higher than the stock. One of the many things I love about Laura is her devotion to God. 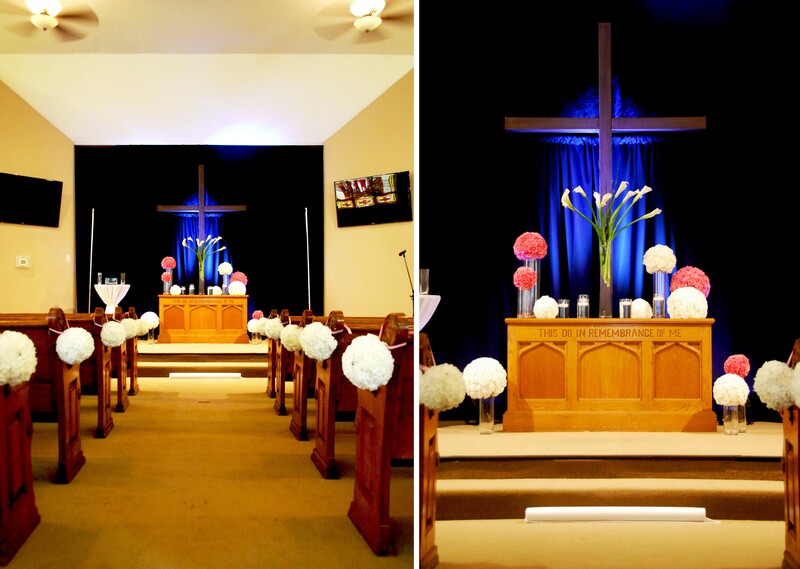 We took the church decor seriously by focusing the design around the cross, which was raised, lit and centered on the altar. 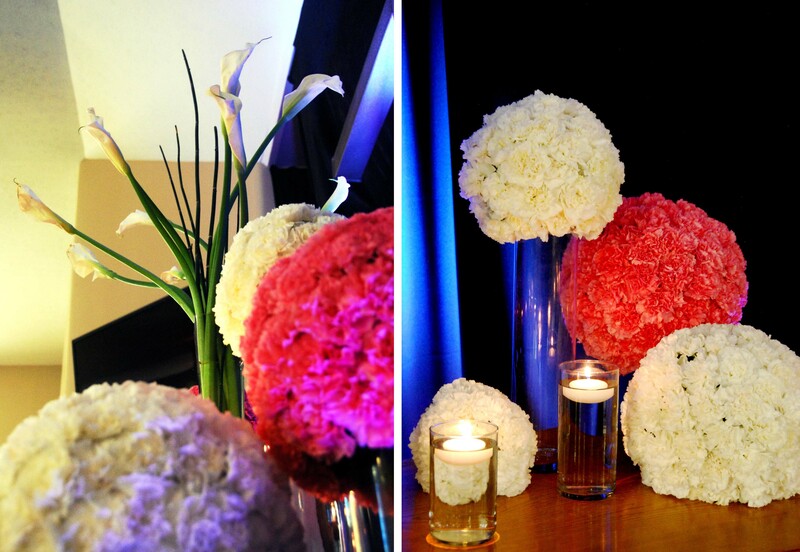 At the reception the centerpieces added elegant finishing touches. 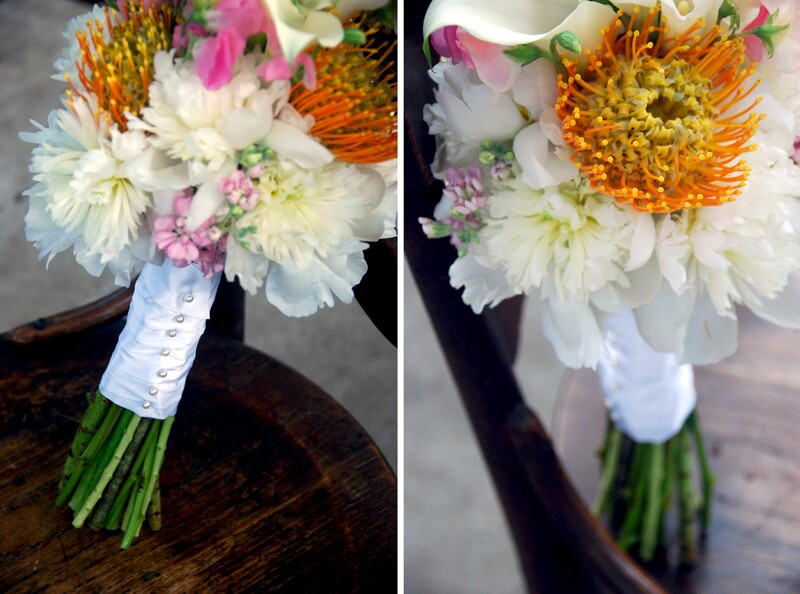 The bright pops of pink mokaras and yellow pin cushions added unusual flair. 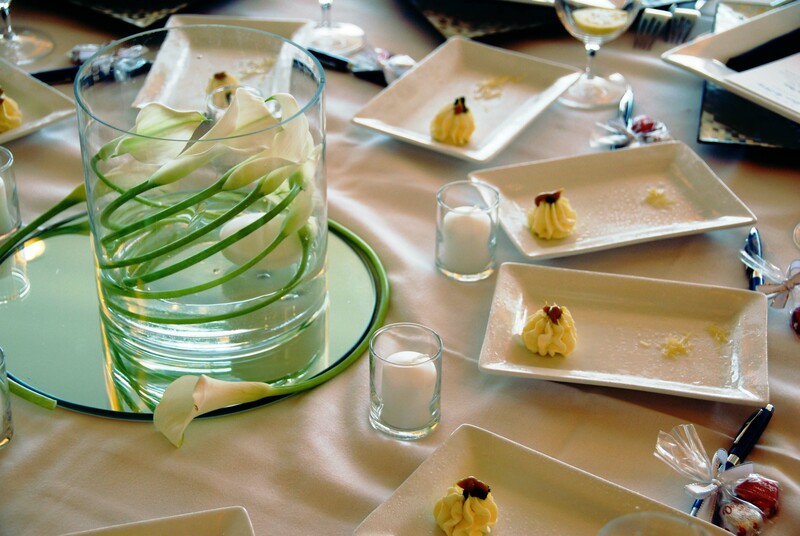 Laura and Carol both wanted centerpieces that were simple yet made an outstanding impact on their guests. 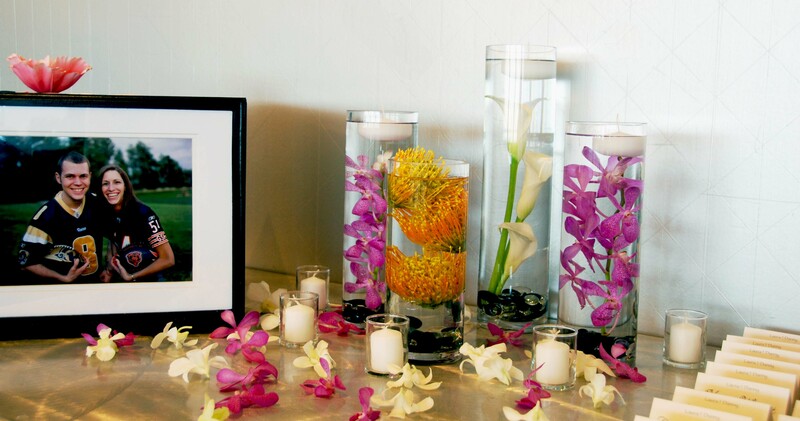 The callas wrapped in a squat cylindrical vase with a floating candle did just that. 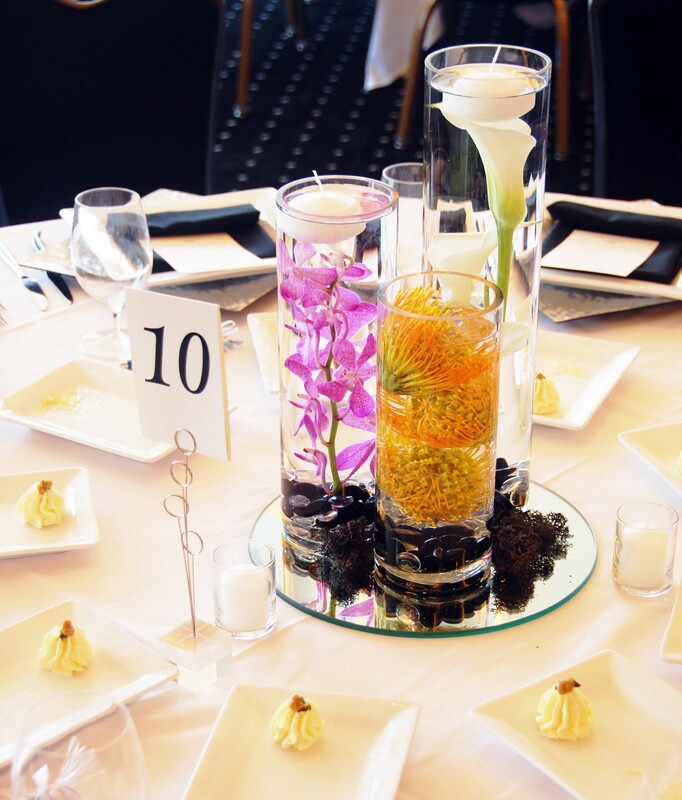 We also added black moss around the submerged centerpieces which caught the eye of many. Overall this wedding was outstanding, and we felt honored to be a part of Laura and Danny's day. 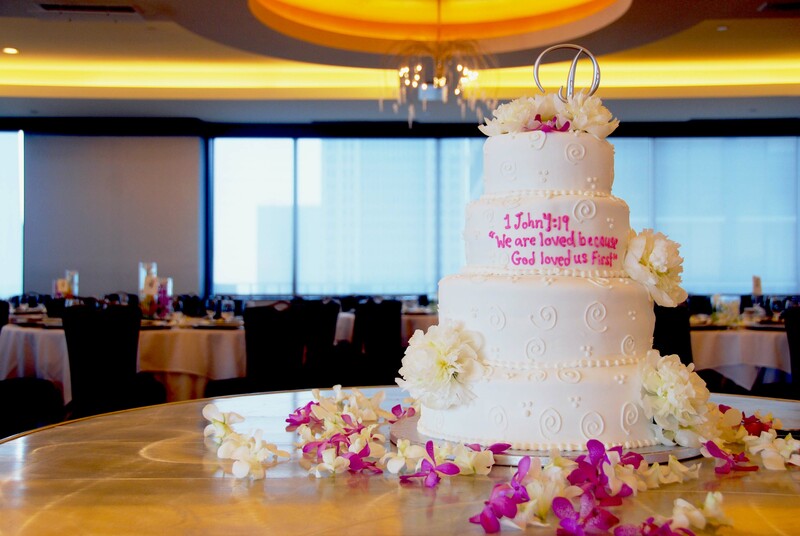 I remember standing in the reception hall after putting my finishing touches on the decor and thought "this is so beautiful." Unfortunately I did not have the pleasure of meeting Danny till the day of the wedding, but we had a great time getting to know each other as he helped us install the church and altar decor. He is a wonderful man and I wish this couple many many years of happiness.